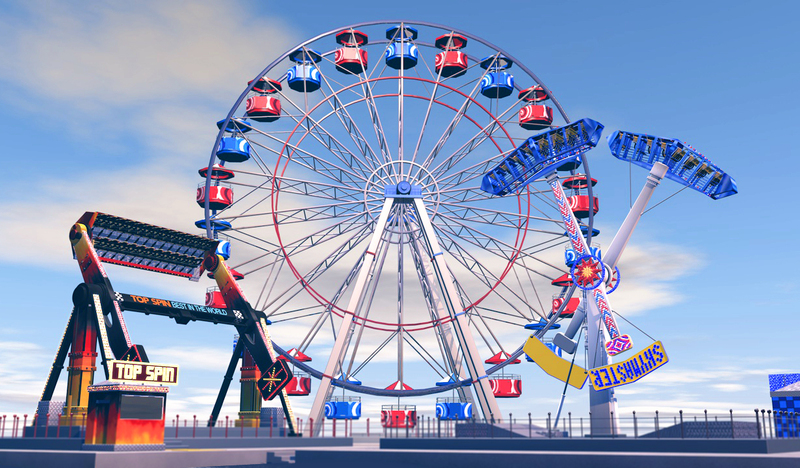 We are spoilt – another new ride has turned up at the fairground! It looks dangerous, and indeed, it’s called Terminator. The attraction has been around since the early nineties. In appearance, it’s not unlike the Top Spin, which arrived several months ago. However, it only has to kick into operation for its distinction to become clear. While perfectly capable of performing the same routine as a Top Spin, the Terminator has one key difference – the arms do not have to rotate in sync with each other. They can be programmed to move independently, twisting and turning the gondola in one heck of a dance. This was an interesting mechanic to try and translate into Cinema 4D. I wanted to try and get the gondola to react smartly to two spinning arms. With the similarities mentioned, common sense suggested a redress of my Top Spin model – even so, it took an awfully long time to update and change to what you see here! That’s probably the closest I came, too. There are so many settings for the Connectors relating to physics and configurations about which I’ve no idea whatsoever, so it was just a case of randomly putting numbers in and seeing what happens. I think that image in itself suggests that, with some brainpower applied, it could probably be done that way. Sadly, it eluded me. I then thought about Targets, which ensure that one object permanently looks at another. It sounded like a behaviour that could be turned to my advantage here; I grouped the tilting lower left arm and the gondola, while putting a target at the bottom of the straight arm. Astonishingly, this seemed to work relatively well! 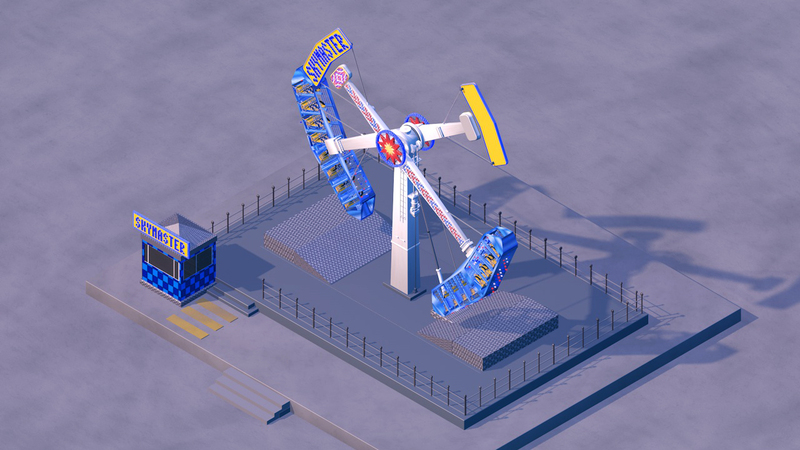 It’s far from perfect; it strays occasionally, again, probably due to my lack of knowledge, but it’s come out significantly better than all of the Connector experiments, and has at least come closer to solving the problem posed by the ride, and project. I’ve only animated the arms in this render snippet – the gondola is bound by its left arm ‘parent’ and the right-hand target. Fun! If you’d like to see the Terminator in real-life action, here we are. One resided at Great Yarmouth Pleasure Beach for several years, but with a far less elaborate diorama. It looked a far more intense ride, though! 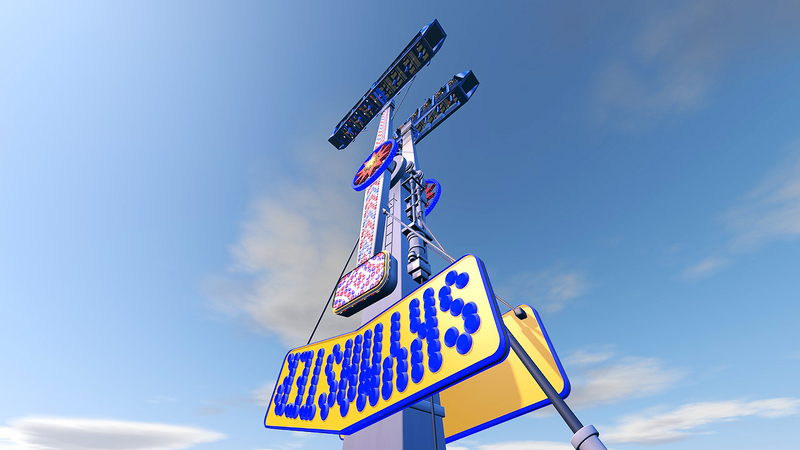 Finally that swirling staple of any decent theme park, the tea cups, has founds its way into my 3D design. What could possibly be more exciting than slowly revolving while sitting in a big cup of tea? Tea-riffic! The teacups are a whimsical variant of a ’tilt-a-whirl’, which has been gracing amusement parks for ninety years. They have the power to go really quite fast, so despite appearances and reputations, it’s not a machine to be underestimated – or should that be, the temperament of the operator pushing the buttons is not to be underestimated. Do size them up beforehand. A neat new spin, if you will, came in the later addition of a central steering wheel, much like the Rock-O-Plane, so you are able to send your little tea cup into a frenzy should you so desire. 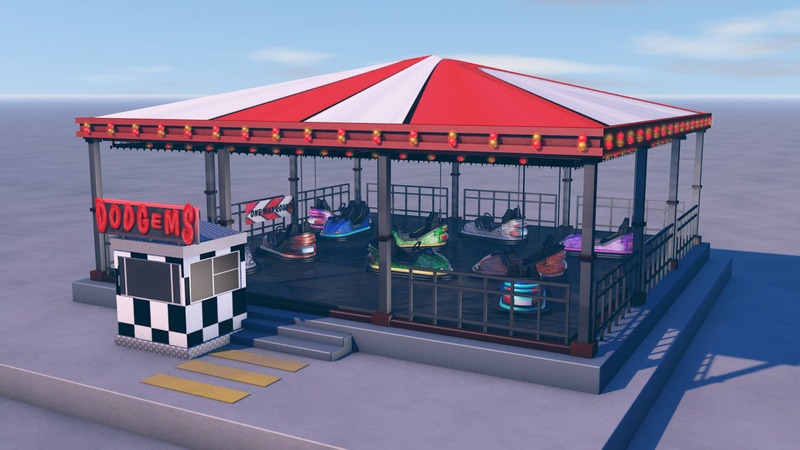 I went heavy on the reflections but toned these down when placing them on the ride stage. Hmm, they looked a little too tea cup for my liking! At this point I also rushed a teapot centrepiece using the same technique as the cups. It looks a bit half-hearted and could do with company, but it’s better than nothing. And just because I didn’t think it was gaudy enough, I overindulged rather on nighttime lighting. I’m sure only the coolest kids would go on that. This is often the part that is the most fun – theme parks, moreover the rides themselves, are to me all about the bright lights and that atmosphere. So, there we have it – any storms in my teacup were sufficiently weathered. Cinema 4D made it pleasingly simple, and this accomplishment should be reassuring when confronting future 3D fears. 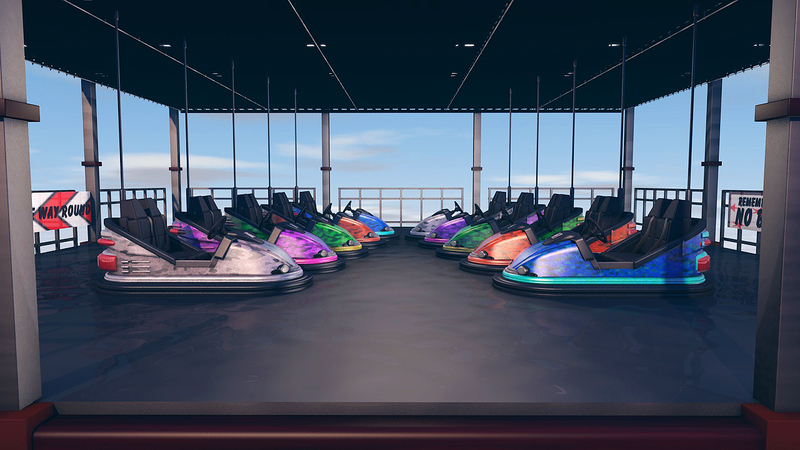 That carousel will happen. It might be 2020 by the time it’s finished, but it will come! As an aside, I thought it worthwhile rendering as an actual cup of tea aswell. I was going to say it’s time for a cuppa, but as it’s 3:30 in the morning here, I’ll probably abandon that plan and consider my morning (by which I mean early afternoon) slurp my reward. I’ve been a bit lax in my blogging duties lately, but I hope to catch up with you over the next day or two. Right now though, I need bed. Keep on rockin’. The wild ride in store for this edition is another at the scary end of the park, and surely one of the most ominous of all – Ejection Seat, Slingshot, reverse bungee, whatever you want to call it, it’s evil. Or at least it looks evil to me… I’ve never been on it, don’t be ridiculous. We had one called Ejector Seat that appeared at the Pleasure Beach in the late 90s – it wasn’t this colourful, mind… in fact it looked old from the get-go and I’m sure had never even seen a lick of paint – but they’ve been around since the mid 70s. It’s an intimate ride, with only two seats in a rather modest gondola. This is attached to two giant arms by elastic cord. 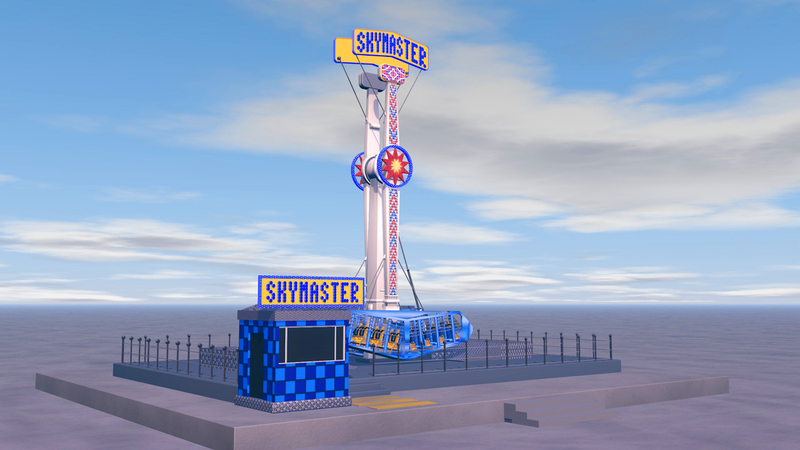 When the riders are in place, the gondola is raised by a crane into position, and there’s terrible suspense as the elastic cord strengthens down from the top. Then, the operator would typically yell “HEADS BACK!! !” as if your life depended on it – it probably did, to be fair – and seconds later, you are released and off you go, ejected at horrifying speed into space, and essentially flung around freely until the cords relax and you are lowered back down, very much a changed person. Much like the bungee jumping it tried to compete with, it was not without dangers; I’m sure I heard that passengers had to sign a contract beforehand, saying they know of the risks involved. …or indeed good for our ride. There was a lot of fumbling around with various forces and air resistance and flexibility and too many to name, but it was exciting to see it gradually come together. I made two cords, one for each side – they are ‘belted’ onto the top of the tower and a notch of the gondola. 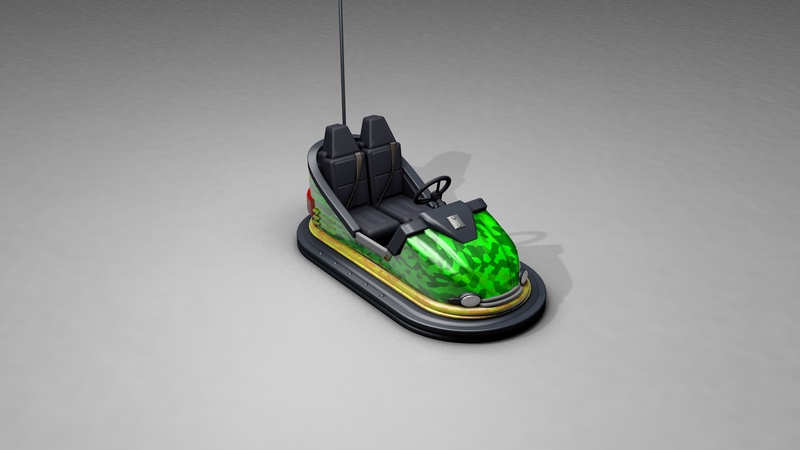 By just moving the gondola around, the cords react dynamically in real-time, which is most enjoyable! Not the most artistically beautiful of my fairground beasts to date, but surely the most valuable exercise, delving beyond the modelling and starting to look at some of the enviable powers afforded to this program. More soon.